I feel like I am finally getting into a routine again. Maybe menu planning, regularly scheduled grocery shopping trips, coupon cutting, etc can resume in my life and I can start feeling a little more organized! As I was sitting here cutting out coupons from the past three Sunday papers, I kept thinking “there has to be a better way!” I love what I use for my coupon holder… a small one photo per page photo album with each category written on the front of the page. I can easily flip through the book, the categories are specific to what I want them to be, the coupons easily fit so I can pull them out and put them in quickly and it fits nicely in my purse. I also have a pretty good system for using the coupons when I need them. What I feel like I am lacking is the ability to maximize my savings with coupons. I am not good at comparison shopping because I find that I don’t have the time to run around town to several different stores. In my ideal world, I would love to be able to get everything in one stop. So, I am turning to you to help me out. 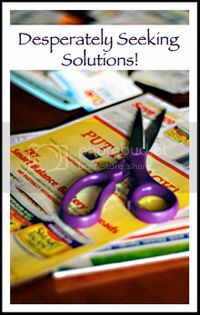 I’d love to hear (or read about this if you have already blogged about it) your solutions for cutting coupons and maximizing your savings. Also, if you have a great way for keeping your coupons organized, I’d love to hear about that as well! Like I said before, there has to be an easier way… I just hope you know what that is! Wish I could help – I’m horrible at coupons. Will look forward to seeing what other input you get though. First, I only cut out coupons for products I will actually buy before the coupon expires. Second, I have found the grocery store I like the most and I shop the sales there. Then I know that even if I have a lot of non-coupon products to buy I can still keep my grocery bill down. Being loyal to a store has advantages such as gas coupons (the more you spend the more free gas you get) and getting better store specific coupons at check out. Also, you get to know the manager and employees and they go out of their way to help you. Also buying store brand items, such as store brand organic milk, saves money over paying for the brand name stuff. If oyu’re still looking for solutions, I can totally help. The last family that I turned on to what I do went from spending $750 a month to around $300 now. I’m very proud of them! First, for organizing coupons, I’ve found the easiest method is to use those plastic pages that kids use to hold their baseball cards. There are nine pockets to each page, and if you don’t have a lot of each coupon, you can use both sides. Then I stick those pages in a binder. Now for actually making the most out of the sales … check out The Grocery Game (www.thegrocerygame.com). Years ago, when I first started couponing, I did it all the hard way, but this web site (has free trial) does all the work for you. It will tell you the best deals of each week at your local stores (even pharmacies like Wal-greens and CVS) and which coupons you need from which circular to capitalize. There’s way more info I can tell you, but those are two good tips to get you started. 🙂 Hope it helps! .-= Cate O’Malley´s last blog ..The Cucina Bella Gang Invades Sweetnicks =-. I agree with Cate O’Malley on the coupon holder, but websites on best deals, I would use A Full Cup.com or Coupon Mom.com. They also tell you the best deals and coupons to use, but these sites are free! Another way of saving some $$$. I don’t coupon…I’m too lazy for it. But I have taken many classes and I have one friend who event nets $$$ every month rather than spends money on groceries. The tip on clipping coupons is DON’T!!! Instead get yourself an accordian file (preferably a small one with a handle) to put them in. Organize each pocket by week. When opening the newspaper, keep each “packet” together and put it into the appropriate pocket. Therefore the first pocket in your acordian file should be from 4 months ago (or whenever you start) since that’s usually how long the coupons are good for and work back from there. On the spine of each “packet” of coupons there will be a code as to its printed date and what marketer printed it (Smart Source – SS, Red Plum – RP, etc). Then use the blogs above (and others out there) to maximize your shopping experience. Example: Using a tip off of Hip2Save you’ll see that not only is something on super sale at your local grocery store/Walgreens/etc but that if you use coupon X found in SS 10/31 that you can actually get the item for cheap/free/money back. By having all the coupons sorted by date you can easily pull out the packet and cut the one coupon that gives you the super sale. By starting this process (which takes a bit of time) you can start stocking up on items and soon your budget will go down and down on grocery items because you’ll already have a pantry/bathroom/etc full of cheap & free deals. .-= CoreyAnn´s last blog ..Tuesday Toots: All Is Quiet On New Year’s Day =-. She does coupon match-ups. She has most of the major KC grocery stores and the major drug stores. I usually shop at hy-vee and target so I see which place has better deals and decide where I’m shopping each week based on that.